This new, all-inclusive beachfront resort is built in a modern colonial style with beautifully designed suites and extraordinary cuisine. Kids frolic in the free-form pool including water slides and diving pool. Adults enjoy the expansive El Cocay Spa and a silent area featuring a mega-Jacuzzi.® Ask about the "Mega Pass," which can be used for discounts on spa treatments, water sports, room upgrades and more. 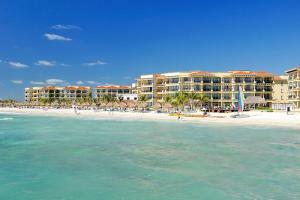 Located between Cancun and Tulum in the picturesque fishing town of Puerto Morelos. 12 miles south of the Airport. Next to the Yacht Club and Puerto Morelos National Reef Park.